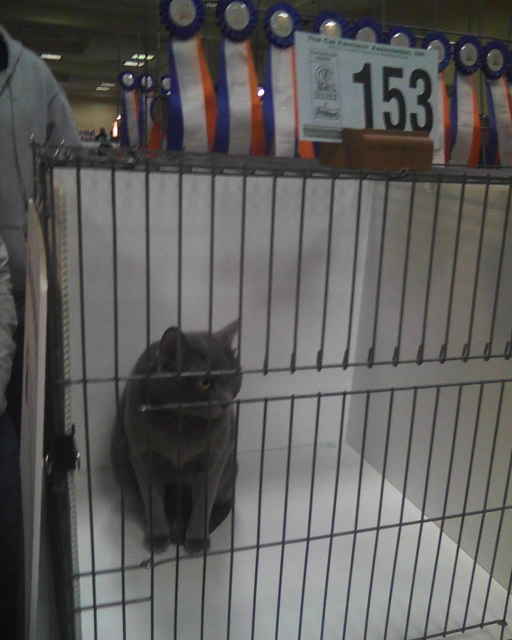 So about the other cats at the show... let's start with those in the class I competed against. Some of them were up for adoption. Some were almost eligible for a regular competition, but not quite. Others just thought it would be fun. There was a Blue Bombay (Sir Zane Grey, #153. He turned 4 years old this week, and was the oldest cat other than me). By CFA guidelines, bombays must be black. (Grey kitties are called blue, and orange kitties are called red.) He was very talkative, and had a cage next to mine in some rings. There was a red exotic shorthair who had no tail (Heads or Tails, #144). He lost it when he was a newborn kitten and his umbilical cord got tied around it. There was another birman (burmese?) -- American curl mix with long hair (Ladi Twittle De De, #160). Someone in her human's family was dying, and wanted kittens. They could not wait for the proper breed, so they took another tom. 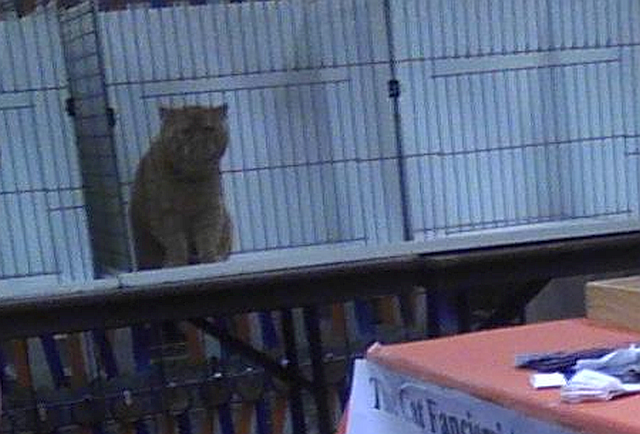 A few cats from Springfield (Illinois) were up for adoption. 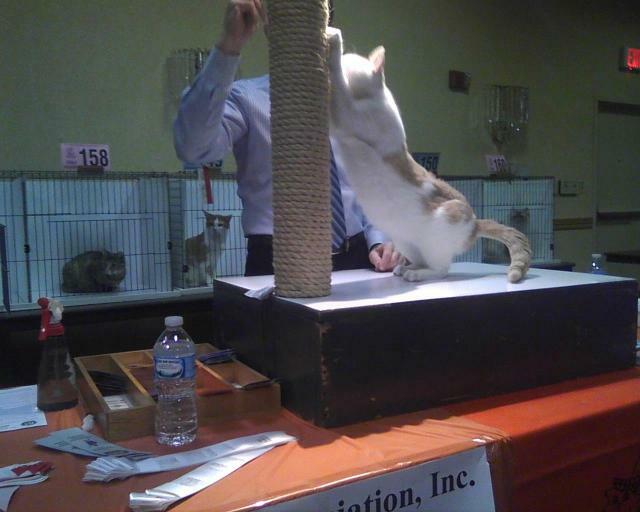 Floyd (cream and white, #148) did very well in the competition -- five top three finishes, he beat me seven out of eight times, and he was adopted -- by the humans of one of the other kitties competing in our ring. The other kitties from Springfield were Brock (blue tabby and white #146), Gulliver (#147 found a home right away), and Millie (torbie, #158). A cat I saw when I last had my picture taken with Mrs Santa Paws was there. 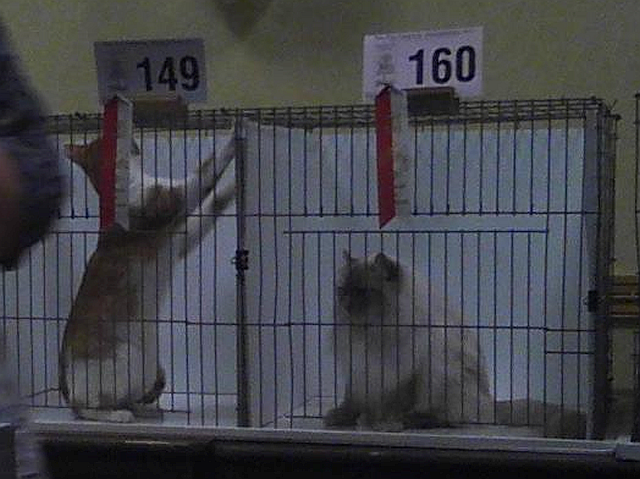 Joey (#149, orange and white) did better when his female human was taking him to the rings. But she was giving vet talks (she's a vet tech who has seen me) on Saturday, so her husband had to take him to the ring, and Joey did not like that. He did not show in the last two rings on Saturday. He took a first on Sunday when the vet herself was giving the talks and the tech could handle him. 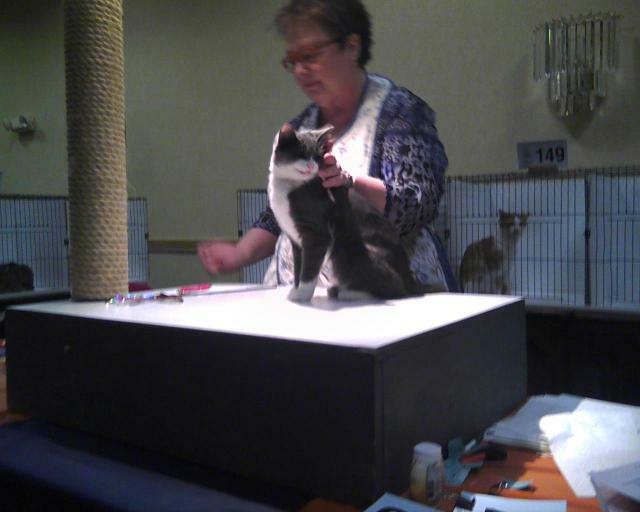 Eight different kitties took first place in the eight rings. Ladi Twittle De De finished second twice.